To understand the psychology of amicable divorce, it is important to understand the principles of the endowment effect and superiority bias. For those just beginning an amicable divorce, it seems like it should be a straightforward process. After all, we’re talking about two mature adults who fully intend to collaborate to reach a fair outcome. Unfortunately, good intentions are not enough. Even couples intent on divorcing amicably find it surprisingly difficult to come to agreement on property issues. 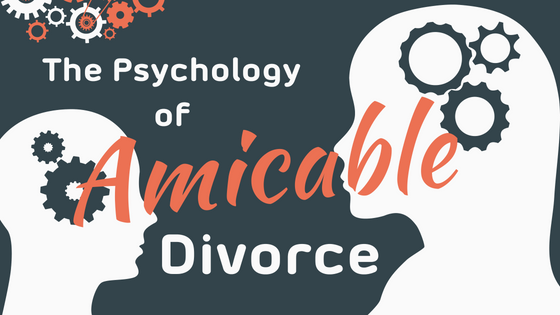 To get to the bottom of it, we’re going to look at two psychological principles that will help us understand the psychology of amicable divorce. The first principle we’ll look at is known as the endowment effect. So, what is the endowment effect? The endowment effect is the tendency people have to place more value on something simply because they own it (Morewedge and Giblin, 2015). Studies have shown that people value something they own more than a similar item that they do not own. And this is true regardless of whether the item was purchased or received as a gift. Essentially, people want to buy items at a cheaper price than they would be willing to sell them at if they owned them. This has an impact when it comes to working out the property settlement during an amicable divorce. The endowment effect explains a phenomenon that is likely to cause both parties to overstate the value of what they are giving up to the other person. They feel an aversion to the loss, and feel that they are giving up more in the property settlement. When you have both parties feeling they are giving up more and that the outcome is unfair, it can lead to a standstill in the negotiations. The second principle we’ll look at is called superiority bias. You may have heard it called the above-average effect. Superiority bias describes how individuals overestimate their own qualities and abilities, relative to others. For example, in a 1976 study of approximately one million US students, 70% of those surveyed placed themselves as above average in leadership ability, 60% thought that they were above average in athletic ability, and a whopping 85% thought they were above average in their ability to get along with others. By definition, there can’t be more than 50% of the population that is above average! And it gets even stranger. One-quarter of those surveyed—that’s 25% of the students—rated themselves in the top 1% on their ability to get along with others. One-quarter thought they were in the top 1%! That means at least 24% of them were wrong. It also means that people aren’t very good judges of their own abilities. And this superiority bias has implications when it comes to an amicable divorce. We know that people are bad at accurately estimating their contribution to the relationship. And if people have overestimated their contribution, it is likely that they will overestimate their entitlement to the shared assets. Let’s see how we can put these two principles together and understand how they affect the psychology of amicable divorce. The endowment effect is the idea that something has more value to me because I own it. Superiority bias explains that people overstate their abilities or contributions. Combine those two ideas together and it’s easy to see how an amicable property settlement can come to a grinding halt. If both parties overestimate their contribution and the value of what they are giving up, it is going to be a challenge to reach a fair outcome. After all, both parties think they are giving up more than the other party is! Now it’s one thing to know about these principles, but that knowledge doesn’t magically lessen their effect on decision-making and determining a fair outcome. Understanding the psychology of amicable divorce highlights the need for impartial support from a third party. An outsider to the relationship can look at the assets from an unbiased perspective. They can avoid the traps of the endowment effect and superiority bias. And most amicable couples instinctively understand this need. And it’s why we created Adieu in the first place. It’s also why we created the Concur Engine. Instead of feelings and overstated estimates, the Concur Engine uses machine learning and expert human advice to calculate the fairness of a potential settlement. It removes the guesswork, helping couples reach a fair, feasible solution. See how Adieu uses coaches and technology to help amicable couples overcome barriers such as the endowment effect to reach a fair settlement.